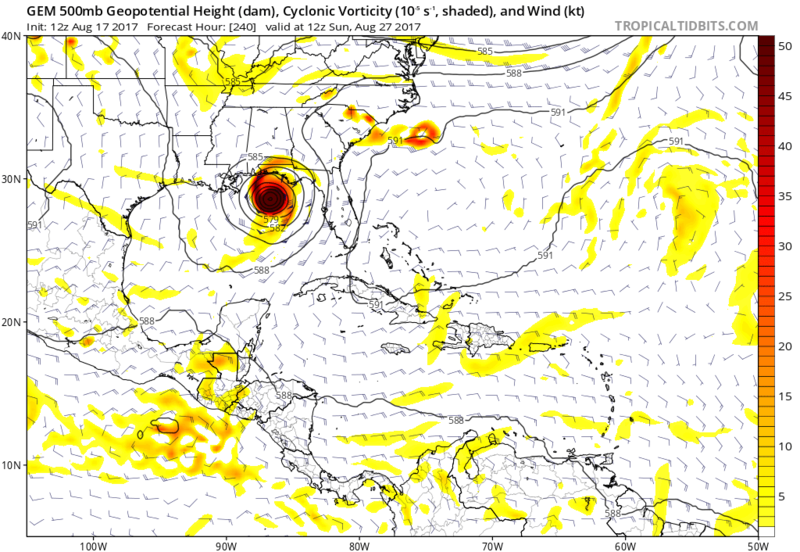 The 12Z GFS may not be developing very much at the surface, but if you look at the 700-850mb Vorticity on the latest GFS, it does show some very weak broad circulation of 92L in the southeastern Gulf in about a weeks time. And like Sky mentioned, regardless of development, the steering pointing towards whatever 92L becomes heading towards the Gulf of Mexico. Here at hour 186, Harvey moved through the Yucatan, into the Bay of Campeche and then into mainland Mexico. cajungal no I don't believe the GFS. It's junk LOL. So I'm looking at the Canadian. 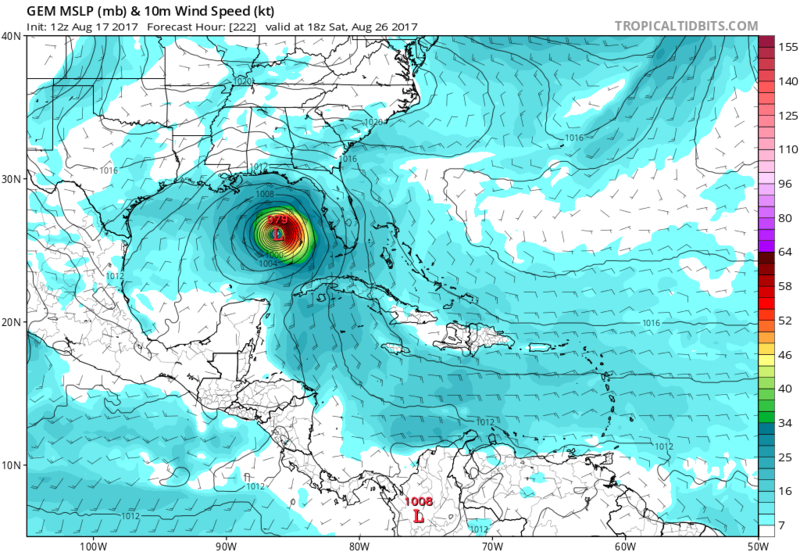 92L (future Irma) can be seen near Cuba, entering the Gulf of Mexico. Just all depends on timing of that trough. 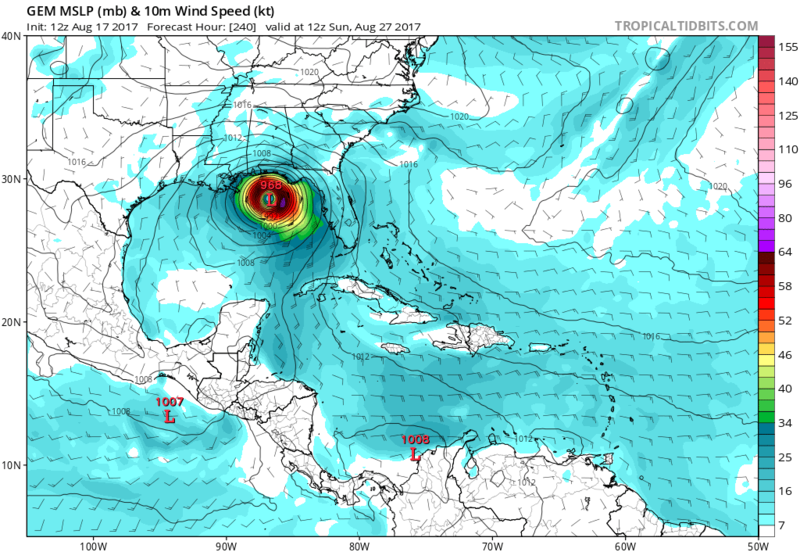 Got to watch for trends and make sure SE Louisiana doesn't come into play. 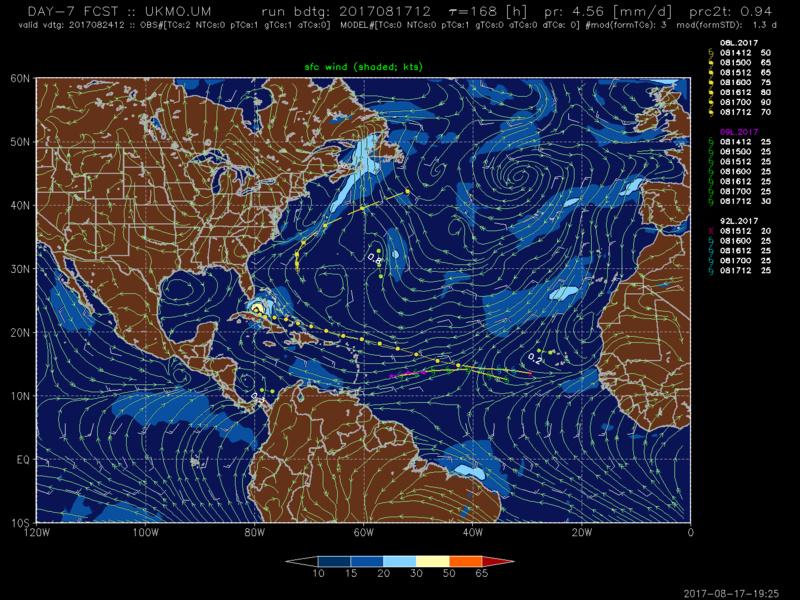 92L actually has a little more moisture to work with as compared to 91L. A sad day when we have to put more confidence in the "crazy uncle" than the GFS! The steering pattern is definitely dangerous. The million dollar question is whether or not it develops. The overall upper environment looks great, but I think the big deciding factor is how strong does Harvey get in the Caribbean? If Harvey gets strong, it's outflow would shear 92L to death in the Bahamas. 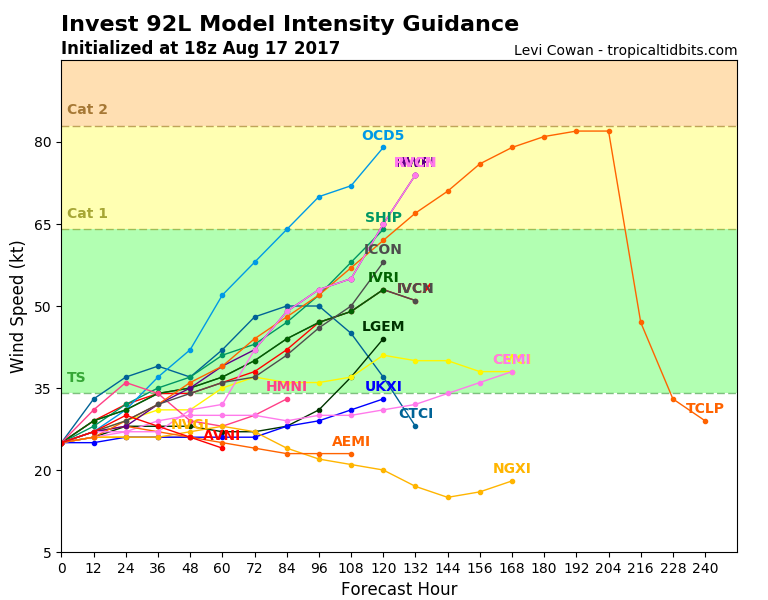 I think if Harvey stays weaker it would help 92L's cause tremendously. Thru 96 hours, this afternoon's Euro is not showing much, in fact not showing much of any tropical activity but will post if it starts to give more love for 92L. 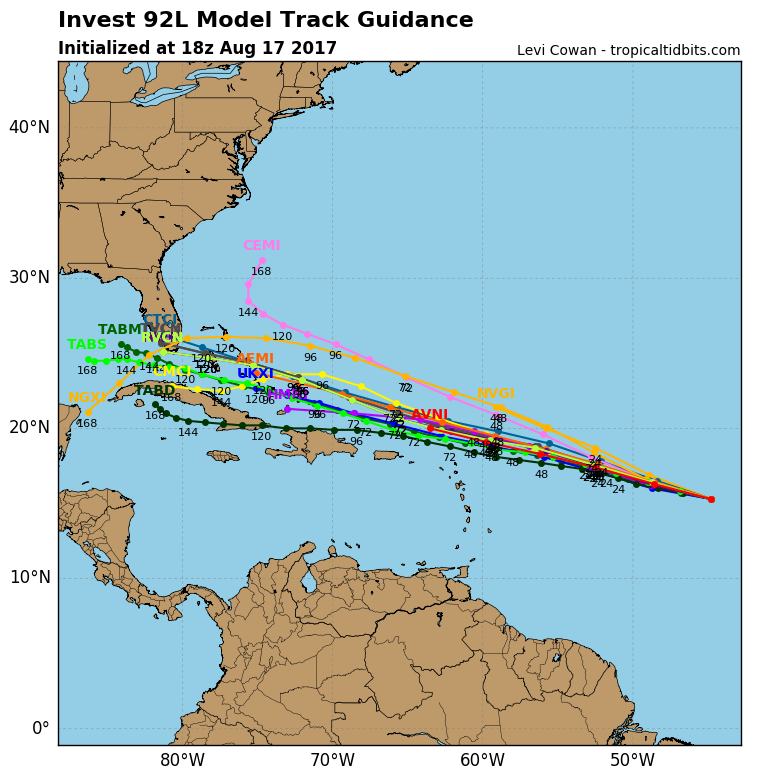 I don't trust the models, but it's REALLY TOUGH, to go against a consistent ECMWF that says no to development. 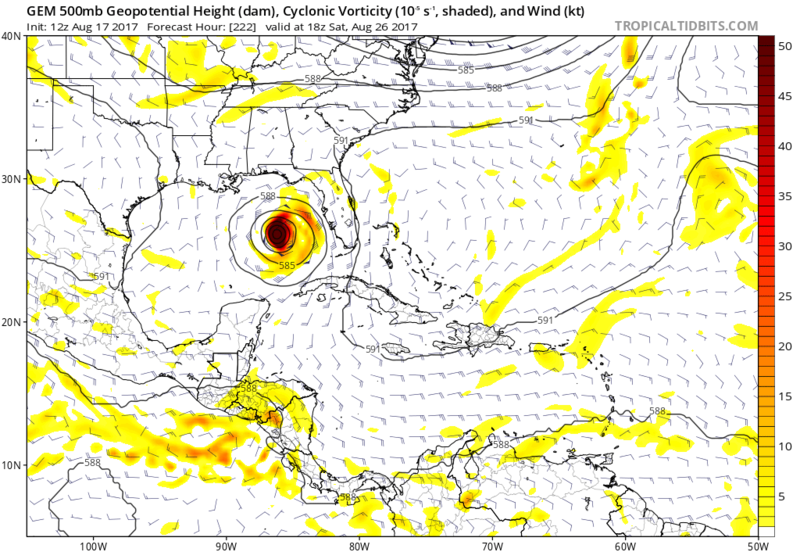 Yea, the ECMWF has Nine as a hurricane in the gulf. 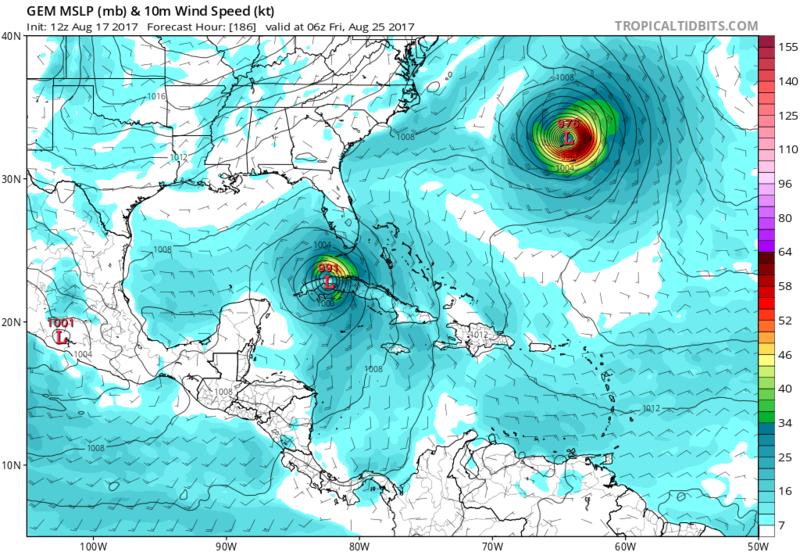 That may kill 92L all together. SST POTENTIAL 0. 1. 1. 3. 6. 12. 18. 23. 27. 31. 34. 38. VERTICAL SHEAR MAG 1. 2. 3. 4. 4. 4. 3. 3. 2. 2. 3. 3. VERTICAL SHEAR ADJ 0. -0. -1. -1. -2. -3. -3. -2. -1. -0. 0. 1. VERTICAL SHEAR DIR 0. -0. -0. -0. -1. -2. -3. -3. -4. -3. -3. -3. 200/250 MB TEMP. -0. -1. -1. -1. -1. -1. -1. -1. -1. 0. 1. 1. THETA_E EXCESS -0. -0. -0. 0. 0. 0. 1. 1. 1. 2. 2. 2. 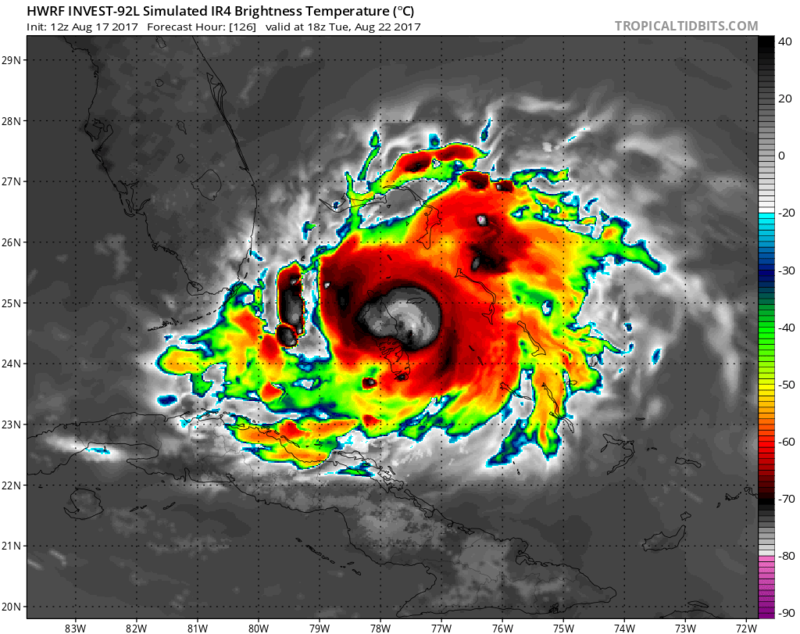 700-500 MB RH -0. -0. -0. -0. -1. -1. -2. -2. -2. -2. -2. -2. MODEL VTX TENDENCY -0. -0. -0. -1. -1. -3. -5. -8. -9. -12. -13. -14. 850 MB ENV VORTICITY -0. -0. -0. -1. -1. -1. -2. -2. -3. -3. -4. -5. 200 MB DIVERGENCE -0. -0. -0. -0. -0. -1. -1. -1. -1. -1. -0. 1. 850-700 T ADVEC -0. 0. 0. 0. 0. 0. 0. 0. 0. 0. -0. -0. ZONAL STORM MOTION -0. 0. 1. 1. 2. 3. 3. 4. 4. 5. 6. 6. DAYS FROM CLIM. PEAK 0. 0. 0. 0. 0. 0. 0. 0. 0. 0. 0. 0. GOES PREDICTORS 0. 1. 1. 1. 0. -0. -1. -2. -2. -2. -2. -2. 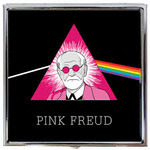 TOTAL CHANGE 2. 3. 5. 7. 10. 12. 16. 18. 22. 27. 33. 39.